The term gets tossed around casually, but separation anxiety is a very serious matter. True separation anxiety is your dog’s panicked response to being left alone. The results — including the destruction of your belongings and the deterioration of your dog’s mental and physical health — can be devastating. Separation anxiety is very different from misbehavior. It’s a misconception that when your dog digs up your prized orchids or urinates on your favorite rug, he’s seeking revenge for having been left home alone. The best-case explanation for such behavior is that he’s bored, and the worst is that he’s in a state of serious panic. But the good news is that, with effort, separation anxiety is treatable. Separation anxiety can result from suffering a traumatic experience, such as a major earthquake or becoming lost in unfamiliar surroundings. Sometimes the death of a person or another pet in the household can trigger the onset. In many cases, no single event causes it — some breeds are simply genetically predisposed. Not all unwanted behaviors qualify as separation anxiety; in fact, most do not. If you come home to find your dog chewing on your old house slippers, in all probability he simply finds the activity enjoyable and uses your absence as a chance to gnaw away, uninterrupted. Or he may just be bored. The behavior occurs every time you leave. The behavior occurs only in your absence. Anxious behaviors begin even before you go. For example, your dog knows that when you put on your jacket, you’re about to leave the house. The minute you reach for your jacket, he begins pacing and howling. In some cases, a veterinarian may prescribe drugs to treat serious separation anxiety. Reconcile, for example, is one such drug that’s new on the market; it’s based on Prozac. Desensitization is the method most often used to treat separation anxiety, however. It entails gradually acclimating your dog to your departure. It is strongly recommended that you seek help from a reputable behaviorist if you think desensitization is your best treatment option. It usually takes eight weeks or less to bring symptoms under control; in rare cases, much longer. For now, here’s a very simplified example of how you would approach the problem: The first step is to get your dog used to hearing the sound of your keys jingling. When he can do that without exhibiting any signs of distress, add picking up your briefcase. Then add walking to the door. Then opening the door. You’ll continue adding actions, in baby steps, until you can leave the house for a period of an hour or more without consequence. If this seems like a slow and tedious process, it is. In the meantime, keep your greetings and goodbyes as low-key as possible. This signals to your dog that coming and going are casual, common occurrences — no need for drama or spectacular displays of emotion. Leave Kongs stuffed with peanut butter or cottage cheese ready for him to dig into as soon as you leave. Hide small treats around the house or in his crate. Make sure his favorite toys are tucked safely in places he knows to search. This gives him something to do while you’re gone and helps eliminate boredom. Tire him out. See that he receives plenty of physical and mental exercise and that he gets lots of time with you. When you do leave, he’ll be more content to sleep or just take it easy. A crate can also be an effective preventive tool. Dogs who’ve been properly introduced to their crate tend to feel safe and secure in this private den. In some cases, dogs prefer the sanctuary of a crate to being left alone in a big open house. Since every dog is different, it’s important to pay attention to exactly which options are comforting to your dog — and which aren’t — before leaving him home alone. 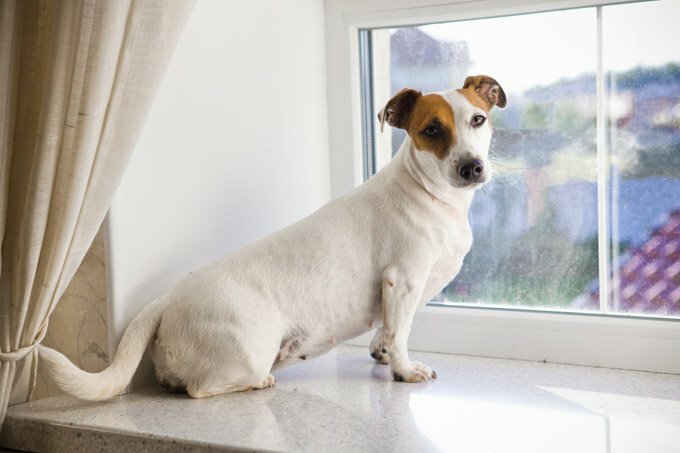 Unfortunately, sometimes separation anxiety just isn’t preventable, especially with an older dog. Experience or genetics may have already triggered the onset. But, thanks to desensitization, crating techniques, and an understanding of the disorder, it’s treatable. In fact, a diagnosis of separation anxiety in no way precludes a healthy and happy existence for your dog. With some extra effort, your relationship can be extremely satisfying for you both. 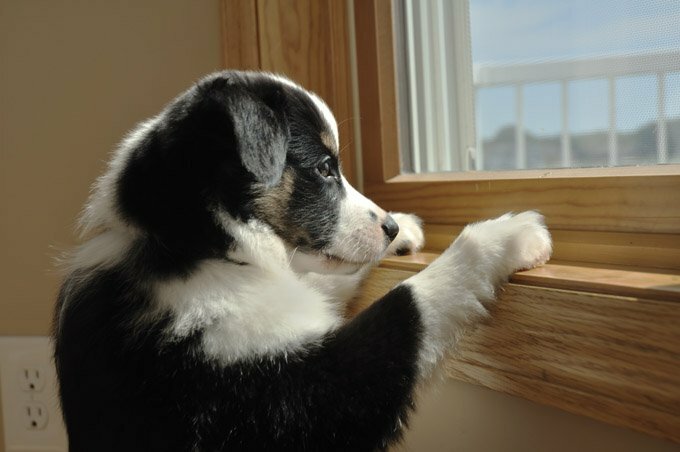 Bottom line: Separation anxiety has little to do with training or discipline; the behaviors are a result of the severe panic your dog feels when you’re not there. Left untreated, it causes damage to your house and belongings — and serious psychological suffering for your dog. For situations that warrant desensitization treatment, it is strongly recommended that you consult a professional.